Evidences, please. No official info discarded that, thus far, to my knowledge. Hate to be a wet blanket but so far it's just a major upgrade for Pentax, not the industry. I'm probably missing something but the lens correction thing, reduced size, and the expectation of a bargain price for the features, are the only things I've seen so far that can't be had somewhere else already... yet. Honestly, dare I say it, I've read every post and I'm still anxiously awaiting the opportunity to get genuinely excited about something. Hopefully the image quality will be the WOW I'm waiting for but it will need to be roughly in the neighborhood of the 5D markII or D700 to get more than polite applause from me. I'm hoping they have found a creative way to make this 1/180 synching feeling in my gut irrelevant to me, because it's relevance to me right now is pretty significant; Especially if I can't drop below 100 ISO. Before you start, Yes I Do realise these are comparisons against full frame cameras but in terms of where pentax is aiming this camera these are the cameras I see as the competition and that is my view that I am entitled to. Pentax is going the APS-C way and doing it in style! These are just a quick done in photoshop sizing up against the hot shoe flash mounts. Last edited by dopeytree; 05-18-2009 at 01:21 PM. 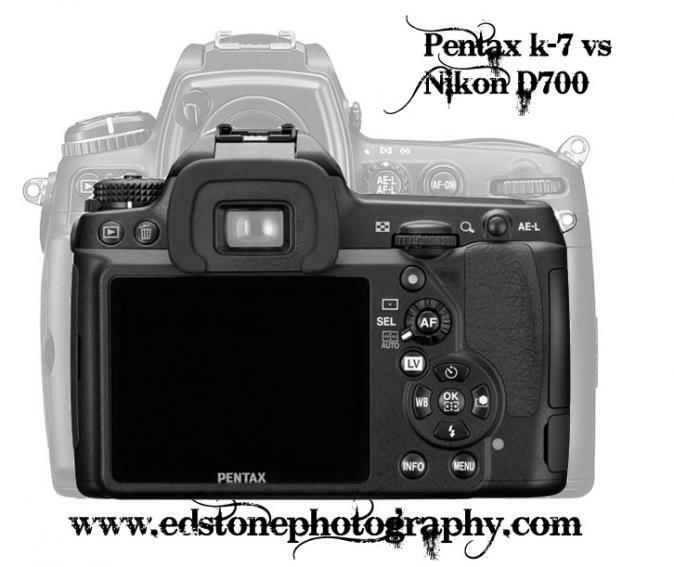 Reason: I deleted the K-7 vs 5D MK II because I'm not so sure about it.. The D700's LCD and hot shoe match up though so it should be correct sizing. K-9 perhaps. Like a police dog of Sorts. Pentax is truly an Innovator. Since all these cameras are now using 3" 920k LCD's wouldn't it be more accurate to overlay based on the LCD's? I agree with those who cannot see a new concept here. If the leaked specs are all there is, we have minor improvements, plus video. That's not a new concept or a camera for photographers. It's a small attempt at catching up to the other brands. Colour me underwhelmed. In fact we lose the nice compartment latches of the K20D, part of what makes it so solid a body. We lose one-touch bracketing. Some stuff is rearranged and that might be good or not, who can say until they use the camera? But none of it is special or more than minor tweaks. The distortion and CA correction features I can do in Photoshop. And I rarely need to, so it won't be saving me much time. Besides, I often shoot with manual focus glass -- this feature will not help there. I am glad to see 100% viewfinder coverage but would prefer 110% -- that would be part of a "new concept". And we actually lose magnification, down 3%, which will hurt. Win some; lose some. So, it's a new body. It has some improvements over the K20D but is not a successor to the K20D. It's a "new concept" but has no new concept. It is a camera for real photographers with soul but is intent on playing feature catch-up rather than displaying any soul. And it's expensive. Together with all the lens price increases it might almost seem that Pentax wants to be the next Nikon, and not the Pentax we knew and loved. Glad the images I did were helpful to a few people. The 5d MKi is just a bit bigger than the K20D, the MKII is about the same size so the K-7 vs MKii comparo is off a bit. humm I know the 30D is actually almost the sme size as the K20D ( well the rebel is ). ...expensive.... not the Pentax we knew and loved. That made me rub my eyes and shake my head in disbelief too. The hot shoes are certainly close to the same size in her image... Hmmm, I'm going to have to investigate this one a little further.